Hubbers and I were out for a jaunt in the countryside last weekend, with the dog, and of course, at about half past three, our thoughts turned to the inevitable. We had been past the Denby Dale Tearooms before, and I'd thought 'Ooh, we ought to take a look', so it seemed a good choice for a quiet unassuming Saturday afternoon. 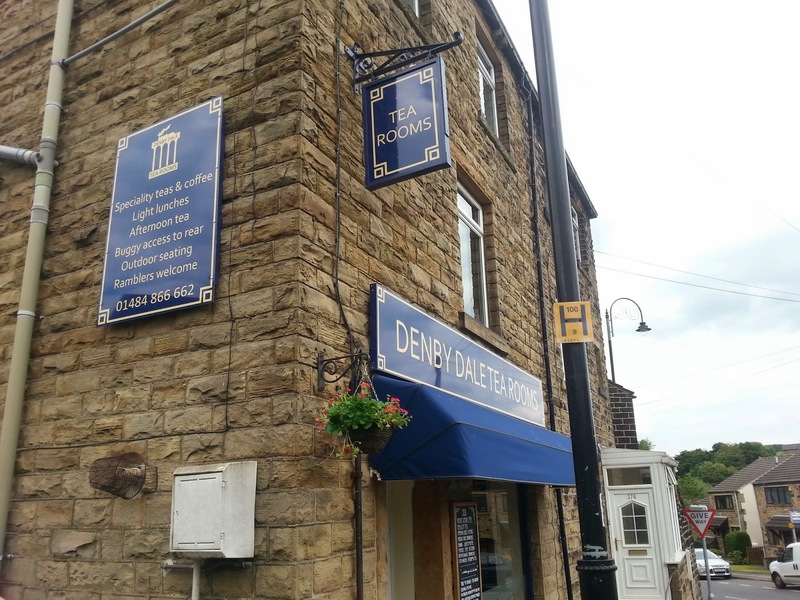 For those of you who don't know the quaint town of Denby Dale, it is a lovely Yorkshire village to the south east of Huddersfield, and just east of the Peak District. I think its claim to fame - other than the tearooms - is its pies. 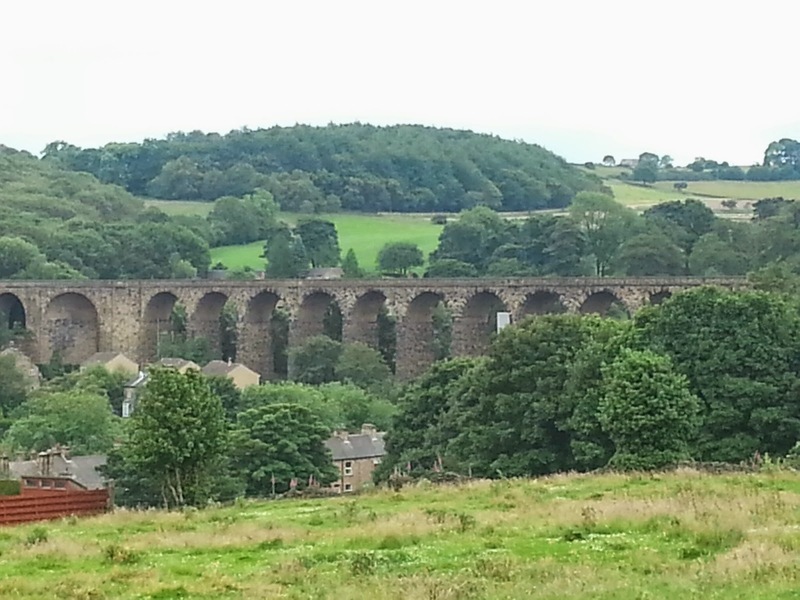 Whenever there is anything new to celebrate - like a royal baby or a coronation, or the millennium - or they need to raise money - for a new church roof or village hall - the residents of Denby Dale bake a pie. A giant pie. The largest, baked to commemorate the turn of the century, weighed twelve tonnes! Anyway, back to the tearooms. We didn't go in the front door, but headed straight for the 'Tea Garden' (a good start already), which happened to be a little terraced garden hugging the steep slope of the valley (this is quite the norm in this part of Yorkshire). Luckily, it was a real sun-trap, and so at quarter to four in the afternoon, it was still bathed in sunlight. We didn't need to look at the menu - although a quick glance told us it was well stocked - and we ordered an Afternoon Tea for two, Yorkshire tea for him, Earl Grey for me. Well, as soon as the tea came, I was grinning. Beautiful, vintage-style teacups! The owner who had taken our order was a big, burly Yorkshire man, and we hadn't seen the interior, so I wasn't expecting the delicate bone china he brought out! The teapots weren't bone china, and the tea was bagged not leaf, but the eclectic mix of retro cups, saucers and little plates were lovely. 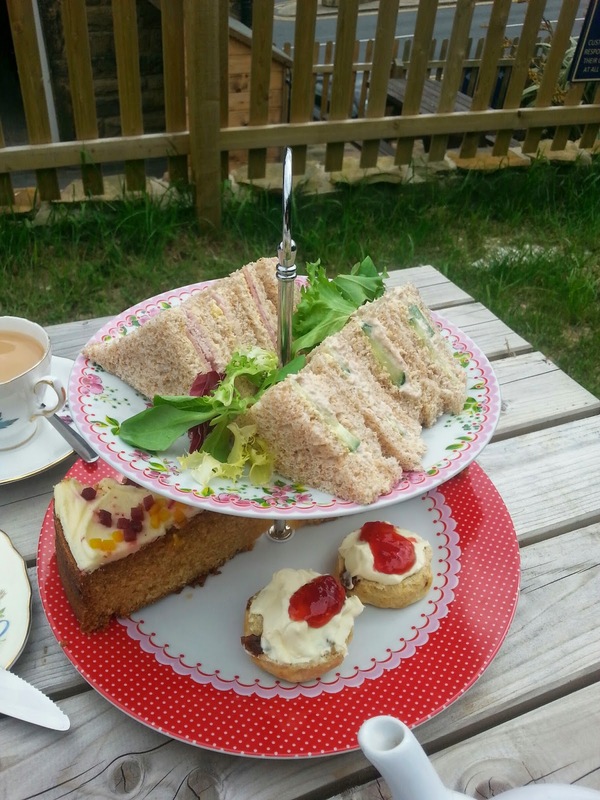 Then our tea came out on a tiered cake stand. It was simple and delicious. Mr CTC had ordered ham and mustard sandwiches, and I had tuna mayonnaise on brown and both were divine. Bite size triangle sandwiches, full or filling, with the corners cut off - perfect. The scones were not quite as we would have served them - they were 'mini scones' already jammed and creamed, but they went very well with the meal, and they befitted the friendly, unpretentious nature of the establishment, so we were happy to indulge. The sandwiches and scones were accompanied by a mysterious cake. Hubby tucked in to his first, and exclaimed how much he liked it and how moist and tasty it was, but how he couldn't put his finger on the flavour. When I tried it, I'm afraid I was none the wiser, but the closest flavour I could find to it was jelly beans or dolly mixture. Could they have made a dolly mixture cake? I'm sure it's possible! Dolly mixture cake or not, we were very pleasantly surprised with the Denby Dale Tearooms. 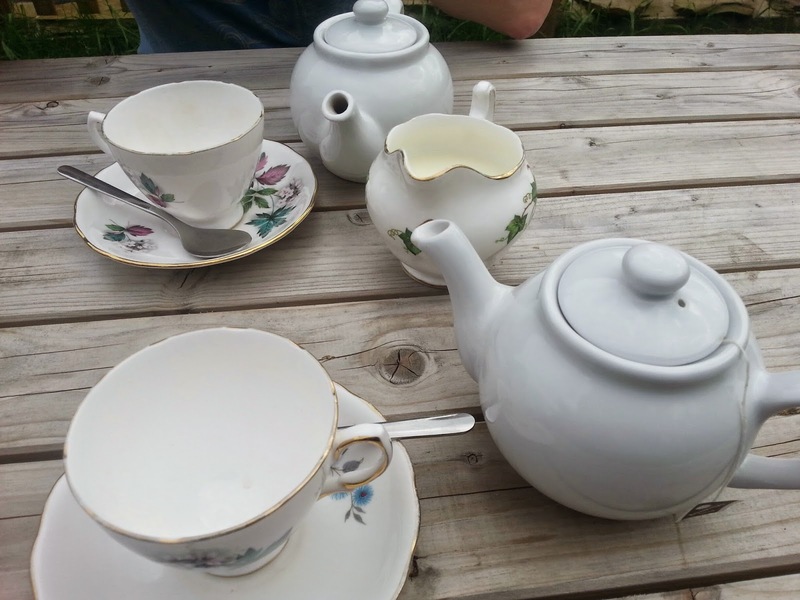 The view from the Tea Garden was good, the food lovely and the vintage teacups topped it off. Friendly, unassuming staff, good prices (£9.95 for an afternoon tea for one), and we could take the dog too. He had a bowl of water and a little lick of clotted cream, so he was happy too! All in all, a very respectable 8.5/10 for the DDTR (points lost only for pre-jammed and creamed scones, stoneware teapots and teabags). Lovely surroundings, lovely outdoor space. It looked very cute inside too, when I went in to pay. The owner did catch me taking a picture of the outside though - whoops! If it weren't for our pockets or our waistlines, I think we'd be back every Saturday!